If you teach in a state that uses the Common Core Standards, then you know that third grade is a big year! Fractions move out of the Geometry standards and into their very own strand of Number and Operations. Second grade students work hard to model halves, thirds, and fourths using rectangles and circles. In third grade the real fun begins! Third graders develop an understanding of the unit fraction, put fractions on the number line, and compare fractions. This is a huge jump; teachers must use “visual fraction models” as repeated in the standards. Fraction bars are awesome visual models. If we truly want our students to gain fraction fluency and see fractions as numbers themselves, then we must provide many different tools and representations to make that happen. My favorite fraction model by far is the fraction bar. I feel that students can pretty easily break a rectangle into however many pieces are needed based on the denominator, and I see such a strong connection to length. I always had my students make their own colored set of bars to keep in their math notebooks. There is a lot of benefit to having them make their own. Students begin to see that Hey! Folding the strip in half doesn’t help me make fifths, but it does help me when it’s time to make tenths! Sometimes it takes a few tries to get fraction bars drawn equally, and that problem solving process is great for students. Plan to have lots of extra colored strips cut. I (of course) would get super nervous about all the time that we were taking to make these personalized sets. Every year I found that the exercise was worth it because of the learning process. We pulled our homemade bars out anytime there was a debate about the solution to a fraction problem. You can find pre-drawn fraction bars online to print and cut. These are great to keep in math centers or just available for students to retrieve when needed. 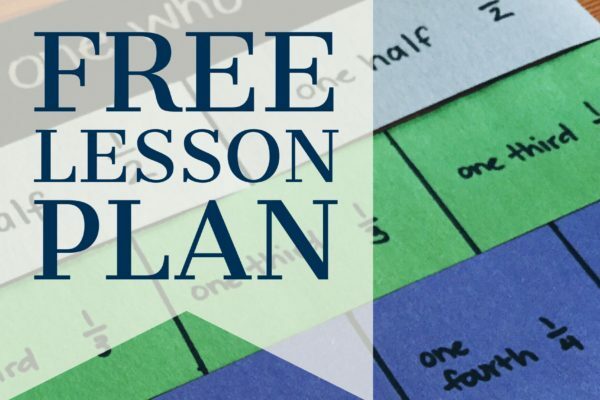 I’ve written a lesson plan that you can use to lead students through this process. Check it out below! I loved learning this fraction phrase from a favorite mathematics methods professor and it carried over into my own math classroom. Reminding my students to refer to the part and whole of every fraction developed stronger number sense and understanding of fractions in general. A simple yet effective method for developing stronger fraction sense can be borrowed from the younger grades: skip counting. When we teach students in the lower grades to skip count, we prepare them for repeated addition and ultimately multiplication. Why not use the same strategy with fractions? Patterns – students will see and begin to internalize patterns as they skip count. Students need to see that fractions have a lot of similarities to whole numbers because most students are pretty comfortable with whole numbers. Fraction Addition – how many students still add the denominators when trying to add fractions in your class? As mentioned with patterns, seeing the similarities to whole numbers will help students understand the function of the denominator. Understanding the reason for “when we add we have to keep the same denominator” gives meaning to this fraction rule. 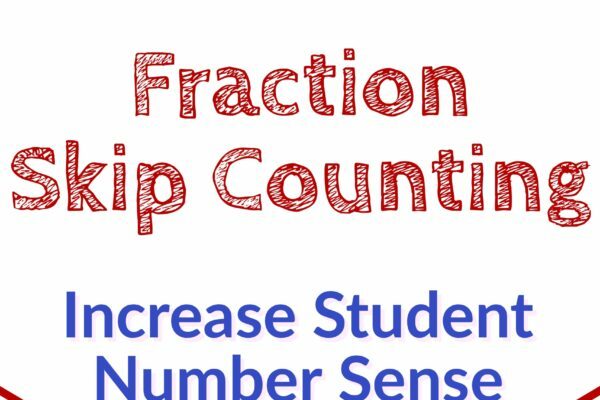 Fraction Multiplication – Just as skip counting whole numbers in lower grades promotes repeated addition that ideally leads to multiplication, so does skip counting with fractions. If students are comfortable skip counting by 1/6’s, then they will understand why 1/6 x 12 is 12/6 or 2. The patterns that emerge from skip counting will have students multiplying unit fractions by whole numbers in no time! 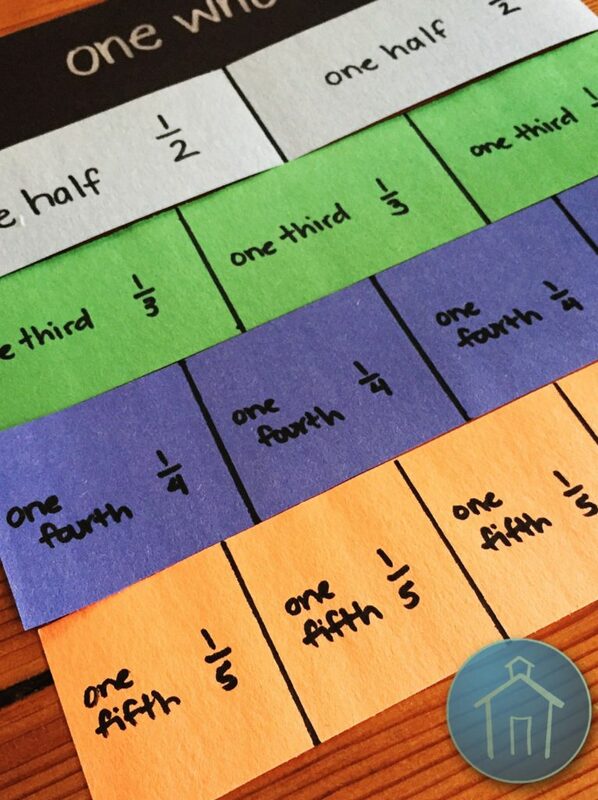 Whole Group – When introducing fractions or as a warm up, students can skip count by any given fraction as a chorus. Start with unit fractions (1/2, 1/3, 1/8, etc) and soon challenge students to count by non-unit fractions (3/8, 2/5, 9/4, etc). Even students who struggle with number sense will hear the patterns and participate more as time goes on. Small Group – Using dry erase boards, notebook paper, or worksheets with blank number lines, have students begin demonstrating their skip counting on the number line. Students will begin to see that the “jumps” need to have equal spacing and will begin to see why improper fractions have a mixed number name as well. 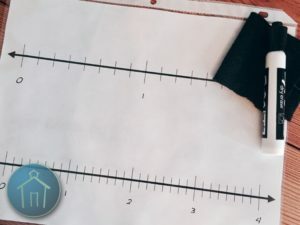 As students begin multiplying unit fractions and whole numbers, counting whole number jumps on the number line will give struggling students a tool to use as they start to see multiplication patterns with fractions. Before or after Recess, Lunch, Pack Up Time – Use the whole group chorus method to have students practice fluency during downtime in the classroom. I know I always had 5 random minutes to fill every day and loved using activities like this to promote fluency. In Games – Students can play a math version of Sparkle (normally a spelling game). Give students a starting fraction and ending fraction that is a multiple of the starting fraction. Once a student reaches the ending fraction, the next student says “Sparkle” and the next student sits down. Continue play until one student remains. There are lots of directions for Sparkle online – check out this explanation! As you can see, it’s not very difficult to fit in this beneficial strategy during the school day. Consistent practice with fractions will give students confidence and stronger number sense. How do you see fitting in skip counting with fractions? Accomplished teachers regularly use formative assessment strategies. Through them, I began to develop a pretty good sense of students’ misconceptions in math. I reached my eighth year of teaching knowing that students dreaded the fraction unit in math. I wasn’t quite sure why. Who doesn’t love problems about pizza and brownie pans? What caused this dread and instant confusion when fractions were announced? The following is a great case for using multiple formative assessment strategies. The setting: my fifth grade advanced math class. We are talking about the top math students in the whole grade level. I was sure they had the most fraction sense of all students! I’d seen something unexpected on a little pre-assessment I gave earlier. I wanted to gauge fraction sense in this class. 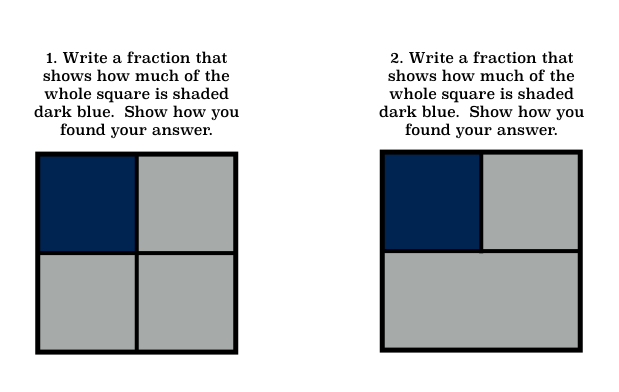 This pre-assessment was a series of fraction sense questions that I didn’t even “grade” – I simply wrote feedback on each student’s paper. This particular pair of questions greatly troubled me when only two students answered correctly. Was it possible that my bright, eager mathematicians really lacked this fundamental understanding about fractions? Surely not. Before handing back the pre-assessments, I decided to use the questions as my warmup – my activating strategy. Take a look and see how you would answer. Sure enough, all but the same two students thought that the answer to question two was one-third. Wow! To me, it’s glaringly obvious that both pictures represent one-fourth! I knew that if I just gave the answer and an explanation the concept would never stick, and we’d yet again struggle through the fraction unit. What did I do? I mentally moved that day’s lesson to the next and spent the next hour of math time in rich discussion about the meaning of fractions, comparing and contrasting the pictures above. We developed strong definitions of numerator, denominator, and equal parts. My students gained so much out of this impromptu lesson, and it was such a fundamental fraction concept. I refered to it regularly as we moved forward. Had I not taken the time to give the pre-assessment and devote so much time to fraction sense, I am not sure we would have reached some of the understandings that the fifth grade curriculum required. My two favorite fraction resources I used to build my unit are Beyond Pizzas and Pies and Elementary and Middle School Mathematics: Teaching Developmentally. These resources provide examples and problems you can adapt for your own classroom and curriculum. 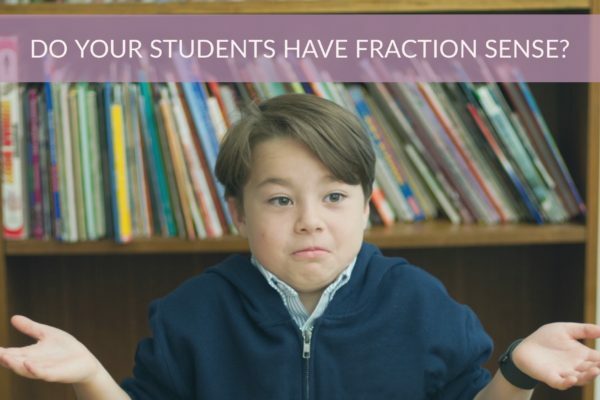 Do your students struggle each year with fractions? Have you used formative assessment tools to determine which fundamental fraction concepts are still fuzzy? 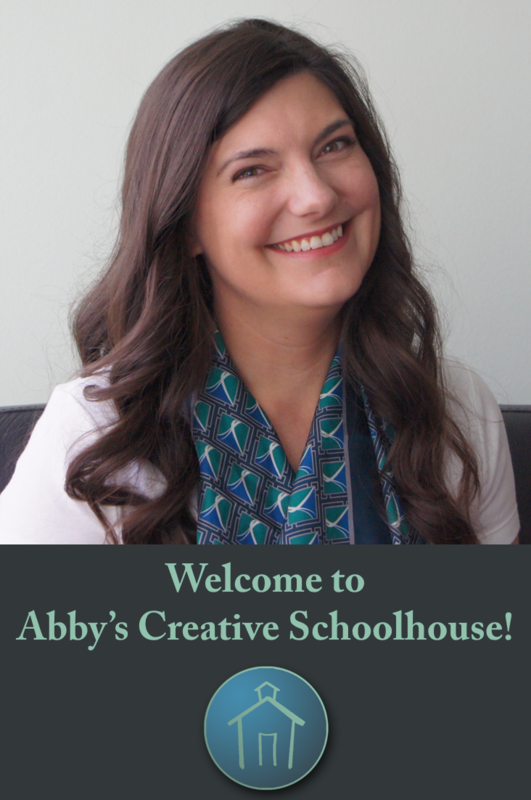 2018 Abby's Creative Schoolhouse LLC. All rights reserved.